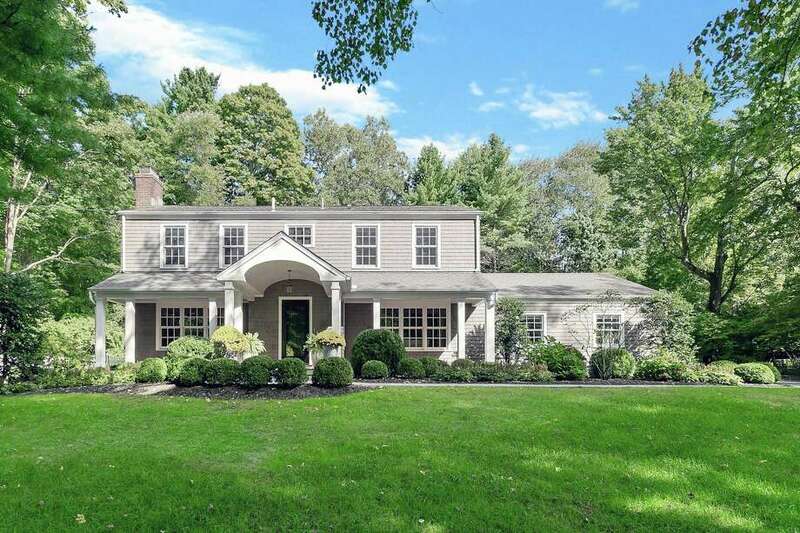 The nine-room, 4,088-square-foot house at 604 Mine Hill Road looks like a typical colonial but inside it has a very modern floor plan and décor. FAIRFIELD — The Boot Hill Grey-colored house at 604 Mine Hill Road looks, from the outside, like it belongs in the Greenfield Hill neighborhood with its typical colonial silhouette. Inside, there is nothing typical about this nine-room, 4,088-square-foot house. It has an open floor plan and a fresh contemporary design that’s perfect for today’s lifestyle. The current owners recognized the home’s flexibility and promise of modern appeal from the first time it came onto their radar. “We knew as soon as we saw the home that it was the one we wanted,” the couple said. The house was built in 1963 on a 1.05-acre level and gently sloping property, and it has benefitted from upgrading. The current owners renovated the house and enhanced it further with professional decorating. They painted the interior rooms in neutral tones and the exterior with a semi-transparent weatherproofing wood stain. They renovated the office, added new custom woodwork, crown molding, and updated the gourmet kitchen and first floor bathroom. Painting and updating continued to the lower level in the finished entertainment room and unfinished storage area. The house is beautifully sited behind a fieldstone wall. Ample parking is available on the side of the house by the attached two-car garage. A bluestone walkway leads to the covered front porch. The front door opens into the foyer, which provides access to the study to the right, the formal living room to the left, and the chef’s kitchen straight ahead. The living room has the home’s only fireplace with a raised hearth against a floor-to-ceiling wall of brick painted white. A wide entryway opens the living room to the formal dining room, which has wainscoting on the lower walls. The dining room has access to the family room and the kitchen. In the deluxe kitchen, the features include a center island topped in butcher’s block, honed granite counters, and high-end appliances including a five-burner Wolf range top and Sub-Zero refrigerator. The island has a warming drawer. Between the kitchen and family room there is a breakfast nook with a bay-like wall of windows. In the family room there is a wall of built-in shelving and cabinetry with windows and window seats on both ends. French doors open to the patio and backyard. The kitchen also has a door to the same patio. Off the kitchen is a half bath and the mudroom with a built-in bench, cubbies above and below, and a closet, and access to the garage. On the second floor there are four bedrooms and an office. The master suite is in a private wing and features a walk-in closet and bath with a claw-foot soaking tub, double vanity, and shower. The office could actually be used as a fifth bedroom, if necessary, or could be annexed by the master bedroom for use as a second walk-in closet and dressing room. The partially finished lower level offers plenty of options for a playroom, recreation or game room, teen hangout, or home gym. Additional storage space is also available on the lower level. The work did not end with the home itself but continued to its attractive surroundings. The owners hired a landscape architect to design low maintenance front and back yards. They worked hard to maintain the New England flavor of the property by keeping the fieldstone walls and they installed a new bluestone walkway. To the professionally designed landscape they added native perennials for color. The property provides plenty of room for relaxation, al fresco dining on the rear patio, and entertaining as it is but, should the next owners prefer, there is room for an in-ground swimming pool. Additionally, this house is not far from the Aspetuck Land Trust Harwood Preserve, Greenfield Hill Congregational Church — site of the popular annual Dogwood Festival, and the Greenfield Hill Grange — which has a summer farmers’ market.